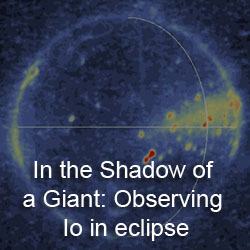 There is a nice blog post by Ted Stryk, guest blogging for the Planetary Society at the Lunar and Planetary Sciences Conference, on some of the presentations from last night's poster sessions and yesterday afternoon's lunar session. One of posters Ted highlights is the one by Kandis Lea Jessup and John Spencer titled, "Detailed Analysis of the Tvashtar Plume Spectral Behavior." I highlighted the abstract for this poster last week. Ted reports that the authors have determined that the S2 to SO2 ratio in the Tvashtar plume was between 0.01 and 0.02. In other words, in their measurements based on images taken by Hubble last February, the plume consisted of significantly more Sulfur dioxide than diatomic Sulfur. 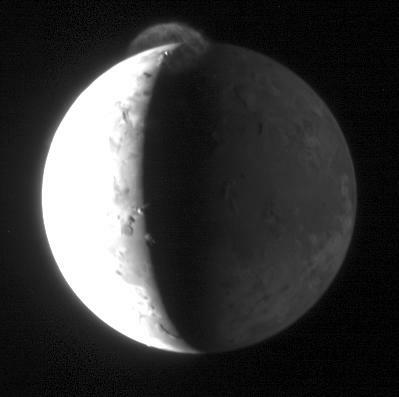 This value would seem to be in conflict with the presence of a red ring plume deposit, which is thought to be caused by the deposition of sulfur from Io's plumes. 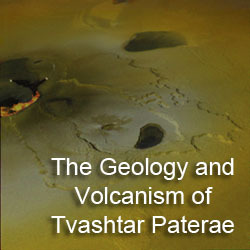 However, measurements of the Pele plume suggest that the Sulfur to Sulfur dioxide in these larger plumes can vary between 0.01 and 0.3, so the low ratio at Tvashtar may not be representative of the average. 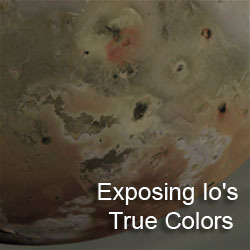 Another consequence of the low S2/SO2 ratio is that the high optical depth seen in the Hubble WFPC2's F255W filter (an ultraviolet filter that senses gases in Io's plumes, rather than the dust seen in visible wavelength images like the LORRI images above) was not due to absorption by S2, but instead is due to SO2. An interesting result. Definitely indicates that Tvashtar's plume was quite gas rich.